Approaching the podium, Dallas middle school teacher Ron Francis faced the circle of 15 large, wooden desks at the Texas State Board of Education’s September meeting. 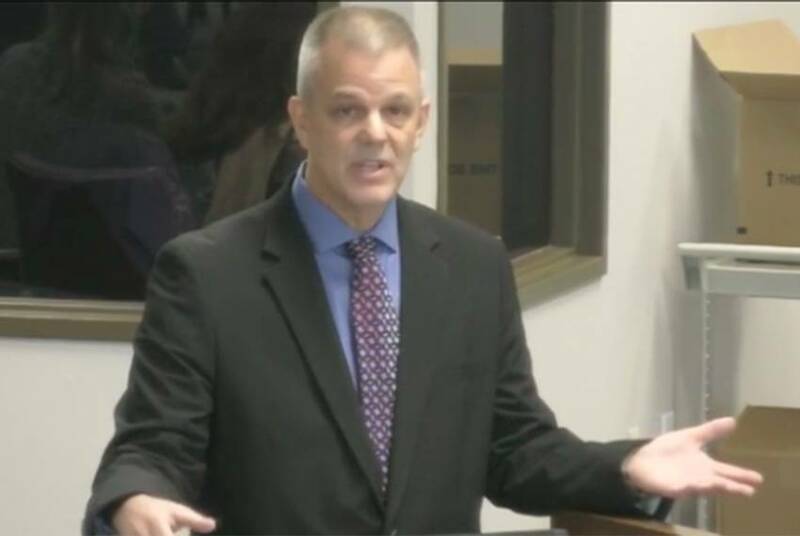 The board was discussing changes to the social studies curriculum standards, the result of a 10-month-long process to cut back on what teachers have to cover in the classroom. But Francis, a 6-foot-tall Army veteran who teaches in Highland Park ISD, was more concerned about what the board wasn’t cutting. The standards currently list slavery alongside three other causes for Texas’ involvement in the Civil War, which he said downplays its historical role. That’s not good enough for Francis. “The lies they’re telling are a little smaller than the lies they used to tell,” he said. But not all Texas teachers choose to step into the fray around the board’s process, which for more than a decade has been characterized by fierce political battles among the board’s liberal, moderate Republican and social conservative factions, each vying to determine what children should be learning. Instead of leaning into the “culture wars,” many teachers said they lie low and wait for the next set of standards, since they have some wiggle room on how they teach those lessons in the classroom. “I’m not supposed to teach reconstruction,” said Marcy Emerick, who teaches 11th grade U.S. History at Akins High School in Austin ISD. “But we spend a day on it.” This year, Emerick said she made a present-day connection to the institutionalized racism of the Civil War’s aftermath by showing a video of last May’s white supremacist rally in Charlottesville and discussing the removal of Confederate monuments. But sometimes she can’t teach all the historical lessons she feels are necessary, because of the demands of preparing students for standardized tests. Reviewing the board’s current proposal for cutting back the standards, she looked at a line that struck the mention of immigrant contributions. Reminders of the State of Texas Assessments of Academic Readiness, or STAAR test, are woven throughout Mondragon’s lessons. 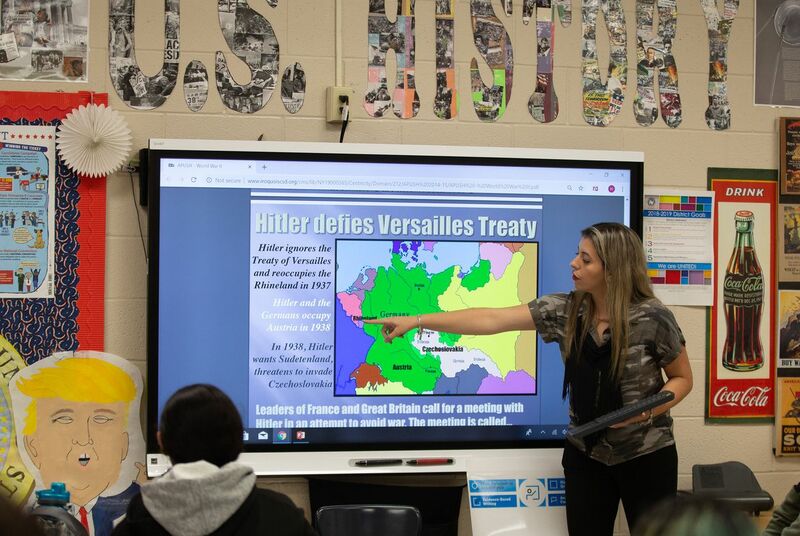 In a lesson on World War II this fall, she paused after mentioning the Munich Conference, starring it on her smart board. “Star,” she told her students, “because it might come on the STAAR.” Students in eighth and 11th grades take the social studies STAAR test. Like most social studies teachers, Francis works to keep his personal politics out of the classroom. “I don’t share my political leanings with the children because that would be inappropriate,” said Francis. “I specifically tell the children that history is a search for the truth and it isn’t political. History can’t be conservative or liberal, the truth just is.” His head-on approach to controversy, though, is relatively uncommon. 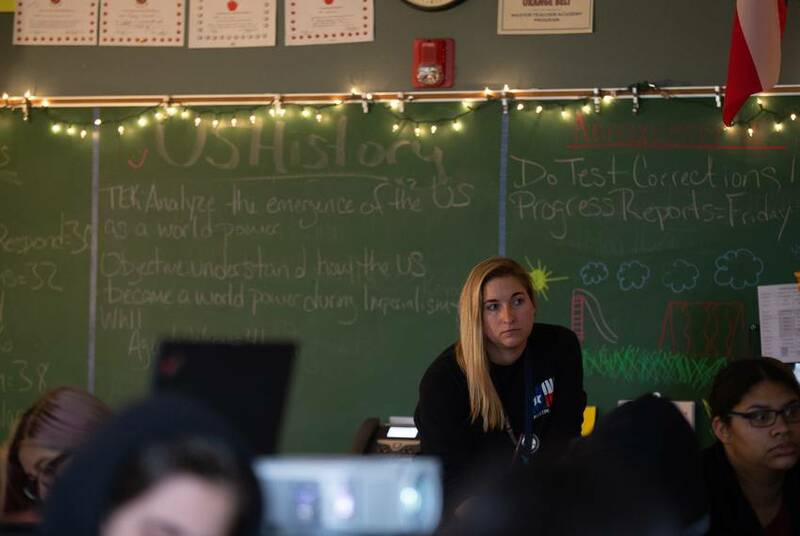 For Mondragon, teaching along the border, there’s a reticence to bringing up politics explicitly – though evidence of the political nature of her subject is sprinkled throughout her classroom décor. On one wall, she has a poster that reads, “We did not cross the border, the border crossed us,” a rallying cry of immigrants’ rights activists. And notably missing from the long line of presidential portraits is the 45th – instead, a painted caricature of President Trump leaned against the wall at the front of the room. They want a class specifically on civic engagement – something that would help them to feel more confident about how to vote when they come of age next year. Marci Deal served on the work groups that recommended the last round of social studies curriculum standards changes in 2010. 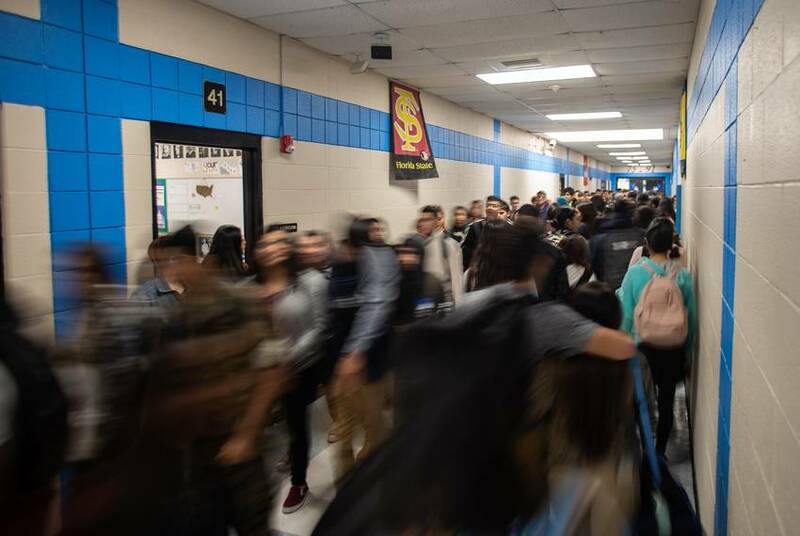 As the social studies supervisor for Hurst Euless Bedford ISD, Deal tells her teachers to “stick to the facts, stay away from the controversial issues.” But inevitably, there are controversial components to the social studies lessons. And that’s the narrative that could prevail when the board meets this week from Tuesday through Friday. Recommendations that were made in work groups and accepted during the September meeting are up for a public hearing, discussion and a final vote. If the board votes to pass the new standards as expected, they’ll go into effect next school year.